Two Special Restoration Books for One Low Price! There are very few books that contain real, solid information about how to market and increase your restoration sales – now, together for the first time, two of the industry’s best restoration marketing books are here for one low price! (order info at the bottom of this page). 4 solid ways to find (and get) jobs without agents or adjusters. And more! A whole lot more! 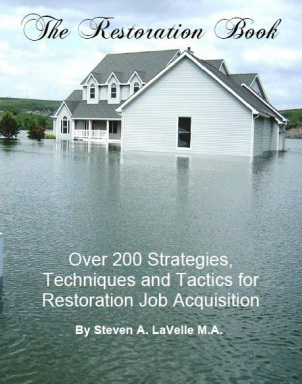 Over 200 Marketing and Sales Strategies, Techniques and Tactics for Restoration Contractors – that are time tested and really work! 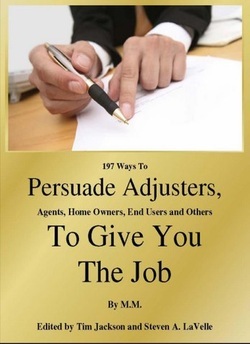 197 Ways to Persuade Adjusters, Agents, Home Owners (and Others) to Give You the Job! 3 tricks lawyers use to win cases that can pay big dividends for restoration pros too! In fact they already have! The “reframe method” that turns antagonism into instant compliance. The one sentence selling strategy that is so simple you can even teach it to your newest tech so he (she) can use it to upsell your services on virtually any job! Almost 200 persuasion and influence tactics that really work! "I have clients that credit their entire success from just one or two tips like those in this book ... but this author has put together almost 200 of them! Get your hands on this, and try just five strategies ... then stand back and watch the difference it makes in your business." - Mark Kennedy, author of "Secrets of the Carpet Cleaning Super-Giants"
Please note that both of these books are in PDF format, delivered to your inbox, and for a limited time you receive BOTH for $197. Don't delay - order your copies today, and they will be in your inbox shortly. This just in! As a bonus for ordering these books, you can now receive the famous "Insider Secrets" restoration book in PDF format!